I first met Rod Hall around 2001. He was instructing students at his military driving school and I’d landed a gig shooting the program for Heartland USA Magazine. I’d run around the Southern California deserts on motorcycles and four-wheel drives since I was a kid, and Mr. Hall, who had more class wins that any American racer, was a legend. Through the viewfinder I observed the master calmly disseminate concise instructions on how to maneuver the big H1 Hummers through some very technical terrain. That day, I listened and observed; hoping to absorb something through osmosis I suppose. 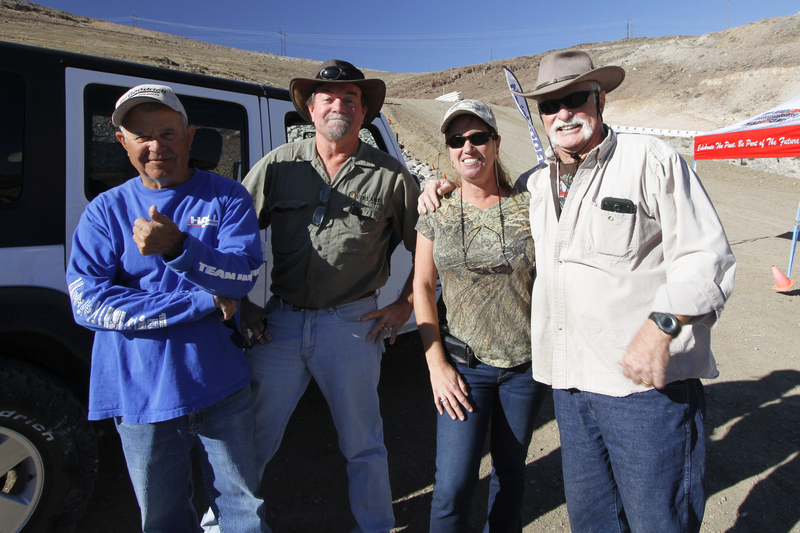 Rod Hall, Chris Collard, and Stacie and Del Albright. A few years later I was sitting next to Rod in Baja, Mexico during the media launch of Hummer’s new H3 Alpha. 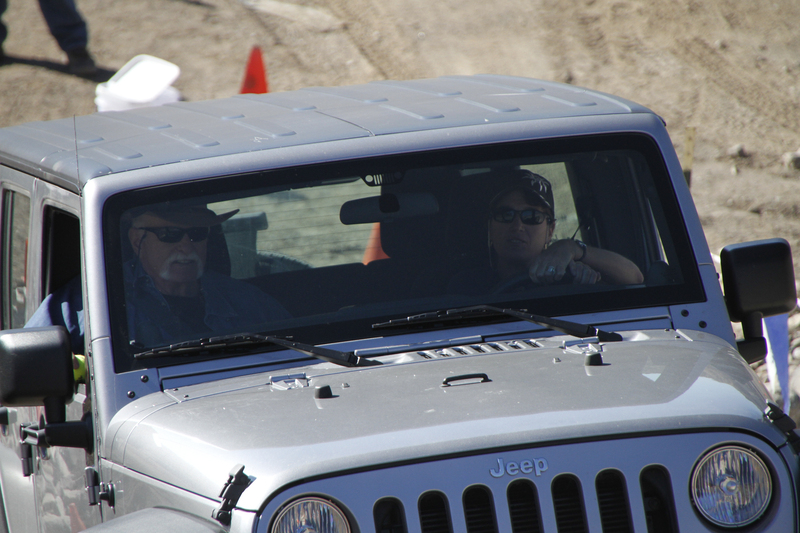 Rod, who had led the Hummer racing team to numerous Baja championships, was guiding the trip and riding with each journalist. 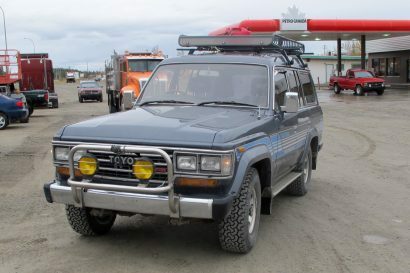 It was on a long winding stretch of dirt two-track north of LaPaz, while attempting to push the car through a high-speed turn, where I was introduced to the wrath of Rod. “Left foot! 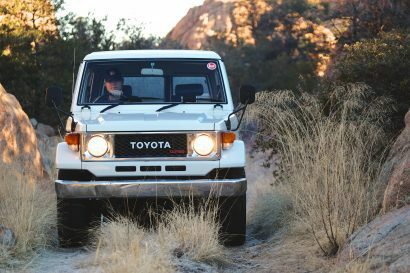 Use your left foot on the brake…” he barked with furled brow and shaking head, “You’ll never drive fast in the dirt unless you learn to brake with your left foot.” I would spend the next decade with those words etched in my short-term memory files. Part of course #1 included a long, steep, downhill section of loose, shale-like granite. Fast forward to October 2014 and I’m once again on the track with Rod Hall, this time at the Wild West Motorsports Park near Reno, Nevada. 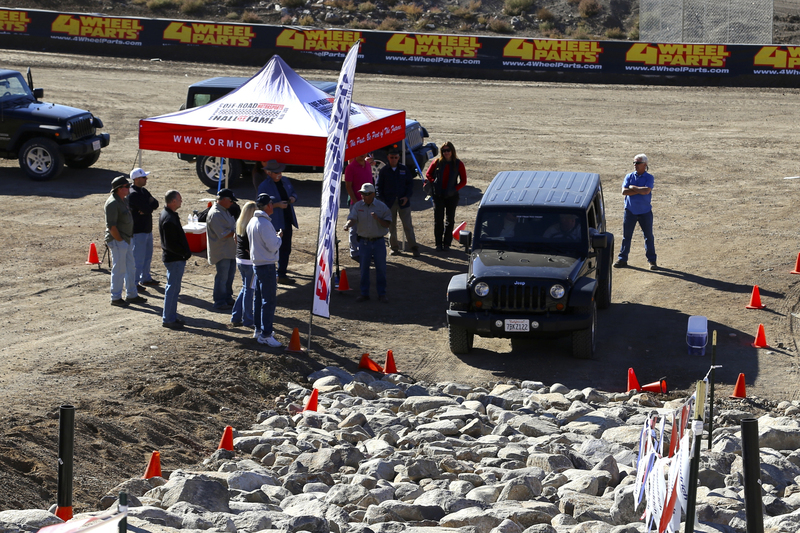 I’m not there for a race, vehicle launch, or magazine gig, but as a participant in the Off-Road Motorsports Hall of Fame’s (ORMHOF) inaugural 4×4 Drive for Excellence Celebrity Pro Am. 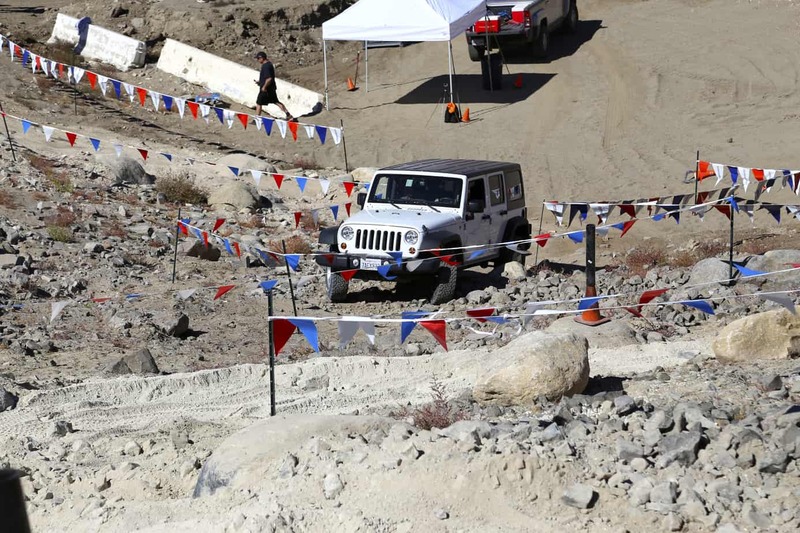 This wouldn’t be an exercise in speed, but in precision driving: maneuvering a stock Jeep JK through technical obstacle courses, cambered sidehill situations, and rocky sluices. 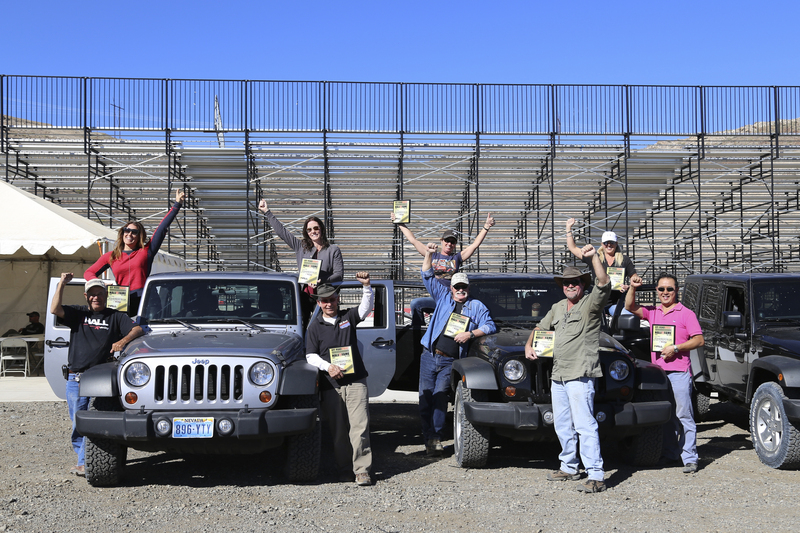 The field consisted of high-profile racers like Baja 1000 champions Jim and Ann Anderson, sisters Amy Lerner and Tricia Reina of Australasian Safari and Aïcha des Gazelles (Morocco), and land-use activists Del and Stacie Albright (Del is also one of the 2014 class of inductees into the Off-Road Motorsports Hall of Fame). Blue Ribbon Director of Operations Del Albright and wife Stacie, also with Blue Ribbon, analyze an upcoming section. 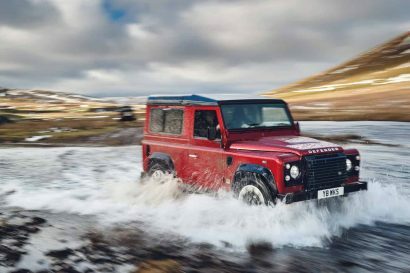 The goal was not to finish in the shortest time, but to master threshold throttle control and allow the vehicle’s traction control to work; about 1,200 to 1,500 rpms. The optimum time was 5.5-minutes, and any deviation resulted in one penalty point for each second you were off. 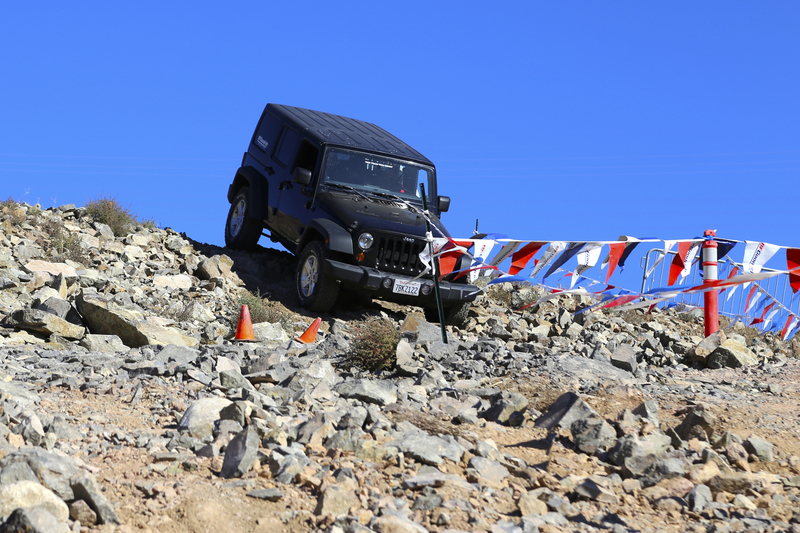 Next was Snake Hill, a steep, loose, and winding track with rocker-panel-sized boulders, tight turns, and numerous, precariously placed ball drops. The perfect, or “par” time was 4.5 minutes. Ann and I each nailed it within 4 seconds. Sisters Amy Lerner and Tricia Reina, who won the Dakar Challenge at the Australasian Safari and Logica EMO Eco Challenge (part of Aïcha des Gazelles) in Morocco, carefully negotiate a sluice. 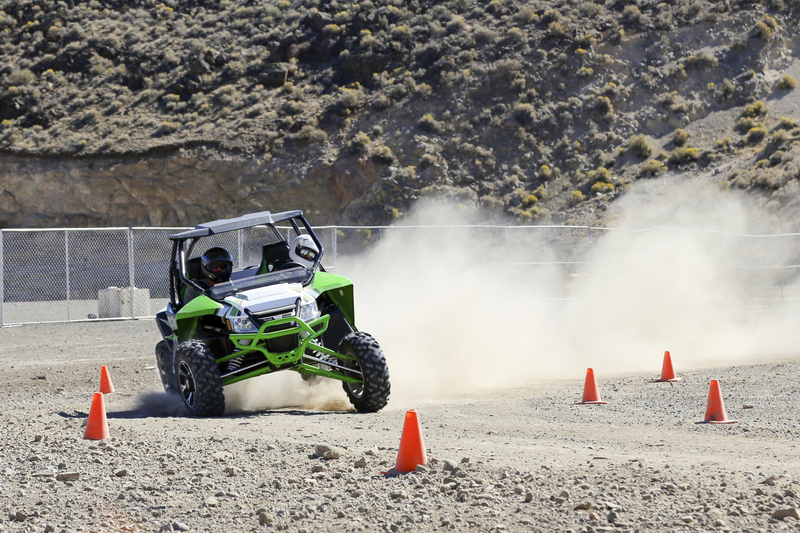 Following the obstacle courses Josh Hall, Rod’s son and founder of Precision Driven Unlimited, led us out to a corral of Arctic Cat Wildcat side-by-sides. After a rundown of the vehicle’s operation and safety protocol (which included insight into the previous day’s rollover), they cut us loose on an emergency braking exercise. The track was a long straightaway, the run-up portion, followed by three tipped-over safety cones and a rope across our path, the braking section. We needed to stop before crossing the rope. Though some failed miserably on their first pass, most had the exercise dialed in by the sixth or seventh pass. The principle behind threshold braking is to maximum pressure to the brake pedal without having the wheels lock up, or skid. My teammate Ann Anderson at the wheel here. 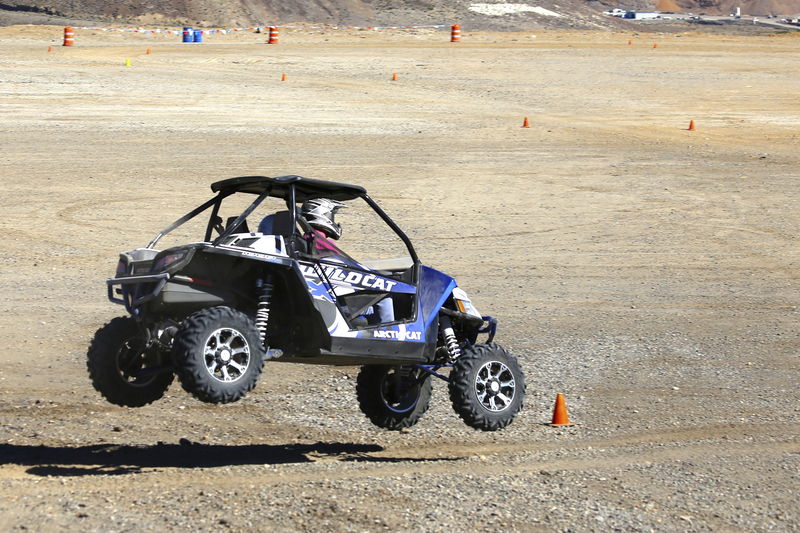 Airtime in a Arctic Cat Wildcat. Next was a large dirt oval with several S-turns on what would normally be the straight sections. The theory behind this exercise was not to simply drive fast, but rather to prepare the vehicle for each turn prior to entering it. To “set it up” with regard to speed, and positioning the vehicle to safely execute the turn at that speed. Though a few of us (myself included) might have had a bit too much fun on this one, the premise was about managing speed, determining position, and keeping your eyes moving, always looking for the turn’s terminus and forward to the next turn. Collard and Anderson en route to a first place finish. The final timed event was a half-mile loop that included gravelly high-speed turns, small hill climbs, a jump, and a couple of ball drops. This was the trickiest course yet, as our “score” was based on our teammate’s time. In other words, the second driver had to match the first driver’s time, and penalty points were accrued for each second you were off. Each driver had to run the loop twice, and as with the other events, stopwatches were not allowed. Ann took the wheel first, and as co-driver I created a mental picture of how fast she drove on each turn—more of a seat-of-the-pants feeling. The strategy we’d agreed on was to drive at a moderate pace, one that could be observed and replicated more easily than running flat-out. We were in good standing from the previous events, but this could make or break us. My turn! I eased off the line and around the first few turns, querying Ann to see if she felt our speed felt right. We made it to the first hill and ball drop. I shifted into low-range and, as she had done, left it there for the rest of the course. I sped up in the flats and slowed for the jumps, reflecting back on her pace and constantly querying, “How is this feeling for speed?” Previous teams had matched each other’s times by as little as 7 and 3 seconds, hard scores to beat. As we rolled across the finish line the judge extended one finger in the air. It wasn’t the middle one, but his index finger. We’d nailed it within one second of Ann’s original time and secured our place at the top of the podium. 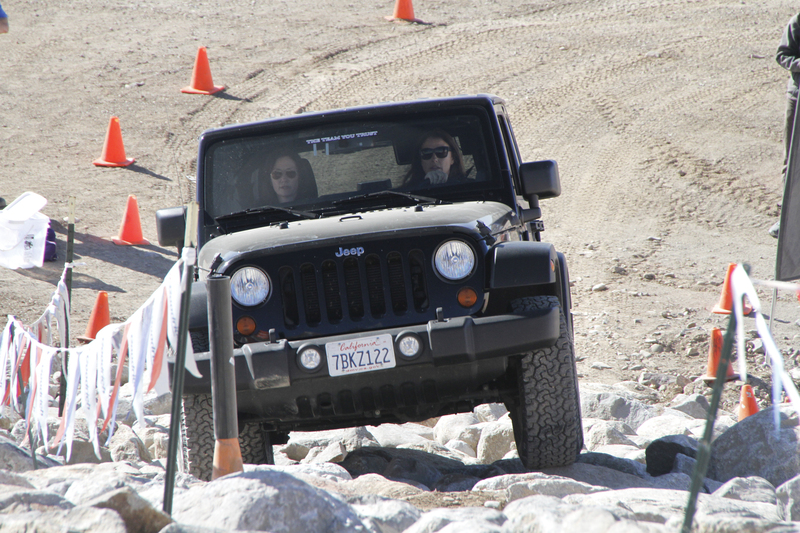 This fun event, which was one of Rod’s must-do “bucket list” items, was sponsored by the Off-Road Motorsports Hall of Fame and managed by Josh Hall, founder of Precision Driven Unlimited driving schools. 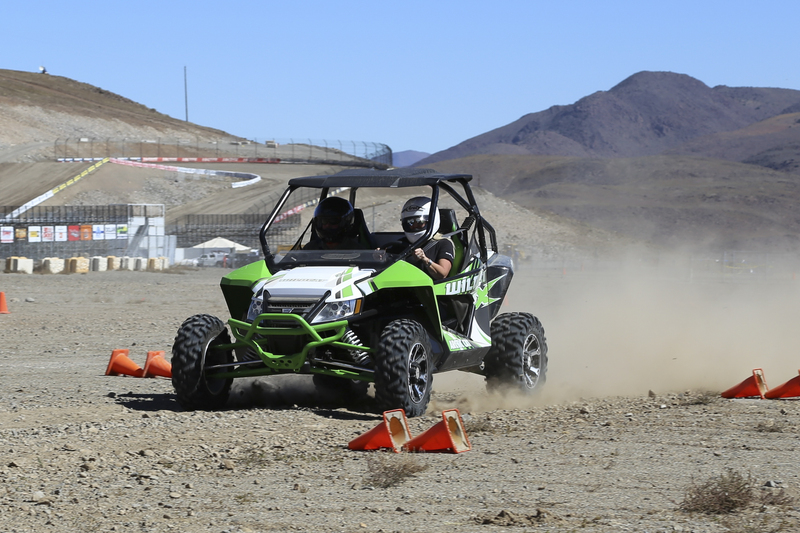 Arctic Cat provided the side-by-sides, and the Wild West Motorsports Park offered the perfect venue. Based on its success, I’m guessing there will be a sequel. Keep an eye on the below websites for updates. 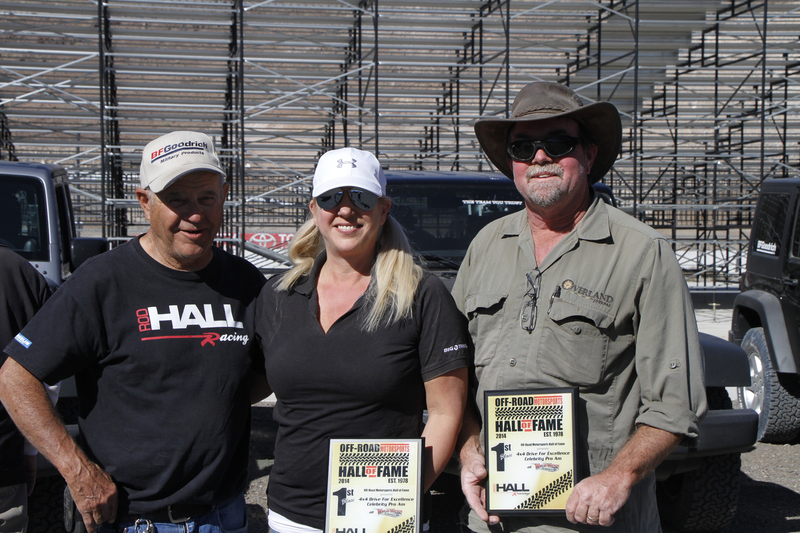 If you are a general motorsports fan, become a member of the Off-Road Motorsports Hall of Fame. 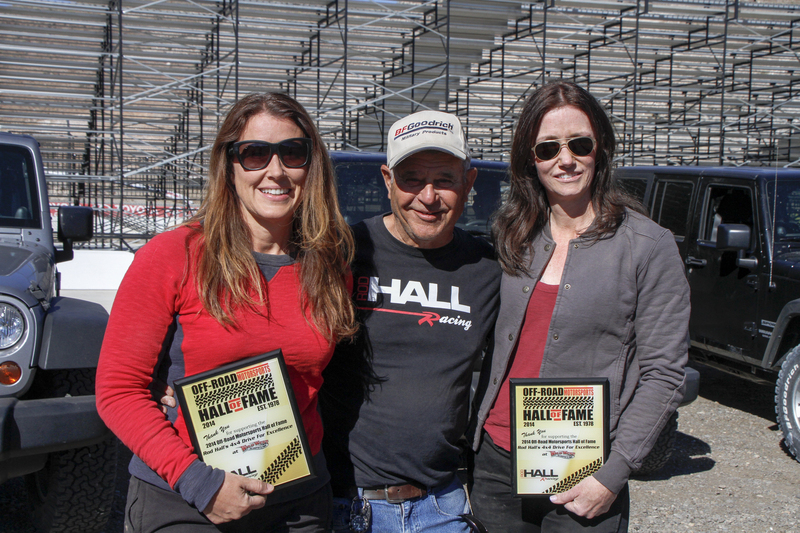 Rod Hall poses with racing sisters Tricia Reina and Amy Lerner.